Commenters displayed a range of (male) sensibilities, including a few who say they not only notice, but enjoy buying jewelry as gifts. Perhaps as men mature they gain an appreciation of art and design. Many thought jewelry a status symbol worn by women to impress other women. Though there are women devoted to carat contests and logo-flashing, I suspect that these men project their own status-seeking behaviour onto women and are blind to a primary reason for jewelry: its aesthetic delight. The majority don't get that a woman will wear a bracelet for her own pleasure, even though she might be alone in her house! I always notice other women's jewelry. Do you? It's fun to look, and looking doesn't imply a covetous nature. Usually, I leave diamond engagement rings out of my gaze; they more or less look alike. 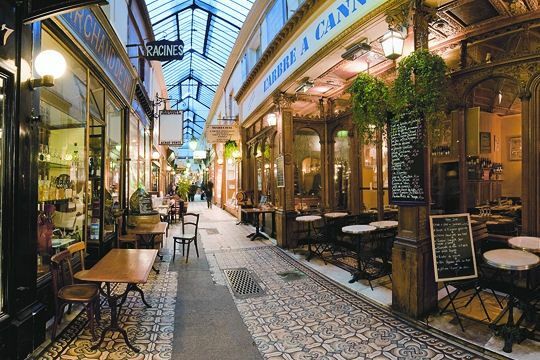 Exception: an 8 ct. emerald cut on the hand of a six-foot, young French woman in a local boutique. We had a short chat abut her upcoming wedding. Pippa Small mixed-hue green tourmaline Sea Urchin earrings set in 18k gold; price, $2,075 at TwistOnline. 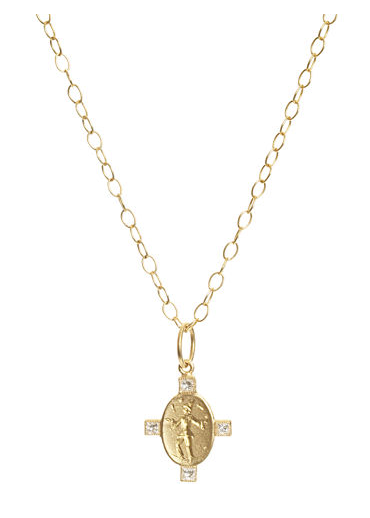 Cathy Waterman 22k gold juggler charm with four diamond accents, on an 18-inch chain; price, $4,160 at Barney's New York. 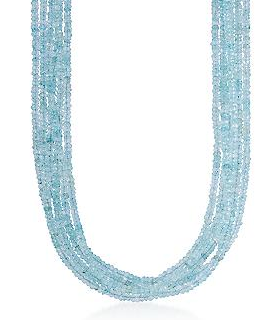 Six-strand pool-blue aquamarine bead necklace with 14k yellow gold clasp; price, $262.50 (18-inch length) at Ross-Simons. 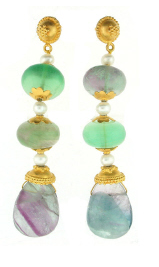 Summery multi-colour agate and pearl drop earrings, set in 18k gold, 3 inches long. Price, $495 at Beladora. I'm seriously eyeing that aquamarine necklace (my birthstone). Maybe I can find some room in next month's budget...I love both sets of earrings, but find my lobes can no longer take the weight of stones. Pippa Small is one of my favorites for sure - love her designs. A very nice selection of jewelry. Interesting about men. I would say my husband notices only if a woman is overloaded in jewelry, a look he doesn't like. I do notice jewelry especially diamond rings. That emerald engagement ring must have been a dazzler! I like your comment of the necklace on the way to the cleavage! Hahahahaha! 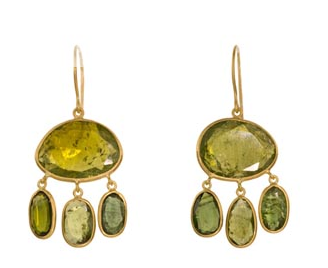 These are beautiful pieces but I am cracking a smile at the idea of jewels under the radar. I think you're right. I notice jewelry only when it particularly enhances a woman's beauty. (Funny how rarely that seems to happen--most women seem to wear jewelry designed NOT to be noticed.) On the train the other day, I couldn't stop staring at a young black woman's earrings--the simplest white pearl studs--gleaming against her skin. And a friend of mine with short, spiky hair wears wonderfully intricate dangling earrings of translucent pink stones that call attention to her soft peach-flushed cheeks. Maybe men react to similar things; when I wear a certain pair of turquoise earrings my husband says, "You look like you have four eyes!" The pieces you've pictured are dreamy--love all those watery colored stones. I had a lot of turquoise (including my "swimming pool" ring) on yesterday to combine with a pale turquoise linen dress and green/blue scarf -- Mr. Pants's comment was, "You're very well-accessorized today. Very elegant." Of course, I wouldn't have minded if he *hadn't* noticed, either, but it's nice to be "seen." Well, my husband doesn't notice anything--either what I wear or how I look--but maybe that's a good thing. C.: Chanel said that all women know how to wear jewelry, but I don't find that quite true. Some are better than others at scale, style, colour. I take it you have strikingly blue eyes! Rubi: Ohhh that sounds luscious! Fugal: Why do you think he does "not notice anything"? How do you feel about that? These questions may be treated as rhetorical as they are quite personal. DH says he doesn't notice jewellery on women much. He couldn't say what he does notice. However, he brags to friends about how I put on dangly earrings and a scarf and it dresses up anything I am wearing. Hmm. I do notice other women's jewelry (I'm a woman). I've had men comment on the jewelry I've worn -- granted they may have been looking for some easy way to flattery -- suppose it's true that mostly women notice such things. However I will say that though I enjoy wearing jewelry, both "real" and, let's say, funky or sparkly or pretty stuff, not jewels, and feel it ties an outfit together, I never wear it in the house. First thing in the door, everything comes off, rings/necklace/earrings/watch whatever. 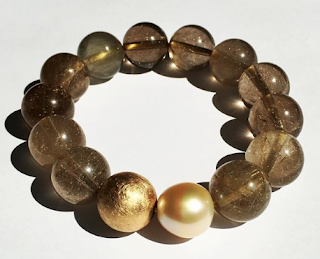 diverchic: I have received an enthusiastic compliment from your husband on a bracelet. But then, you gave it to me! 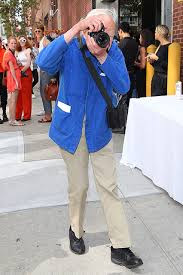 I think all red-blooded, straight males look at *some* aspect of a woman- Ian Brown, in another G&M piece, wrote of how he loves to look at women when summer removes some layers and was both hotly criticized and warmly applauded for his honesty. Lin: Le Duc says he found the men replying on the comment section of Smith's post quite unsophisticated... mostly young 'dude' types. In my experience, men notice but sometimes do not comment as they think it may be perceived as too personal, even intimate. In other words, the old-school gentleman does not feel compelled to speak, only to admire. Hardly anyone is as sophisticated about women as Le Duc! I find myself drawn to bracelets recently. Unlke earrings and most necklaces, I can fully enjoy the aesthetics of a bracelet while I'm wearing it. Kathleen; So true- when buying earrings I often think "These are for the pleasure of others". But rings and bracelets please me, and I enjoy longer necklaces or pendants which I can see too. At long last I am catching up on your writing - and what an opportune post! Just two days ago my husband and I were chatting with a friend who had noticed my earrings, which are a favorite pair of simple, raw aquamarines on 18k hooks. He asked my husband if he liked them, had they been a gift etc.. Anyway we talked a bit about my collecting and how it's a pursuit and pleasure that my husband isn't comfortable delving into, even though he likes what I wear. They agreed that it's often the slightly unusual in texture or color that attracts an admirer's eye, and not necessarily the wattage of the bling. Though that's fun too. Like you, I enjoy those longer necklaces, rings and bracelets for the enjoyment they give back to me all day. HB: Thanks; I will not be posting in July and August. A partner does not have to share an avid interest, but support is pleasing. Le Duc is deeply interested in stones; he will often haul *me* into a jeweler's or attend an auction. Ah, lucky you to have that interest in your partner. What fun! I will say that my mister is excellent at finding shoes for me - another topic for another day. I hope your summer is lovely; somehow I fell off the internet habit during this winter, but still enjoy reading your thoughtful posts, even out of synch as I am.